My search for a new capable 15 inch range laptop is now over, I bought this ASUS F554LA-WS71 laptop a week ago, and I am happy with my purchase, here is why. This laptop is definitely not the best laptop nor has the perfect specs on the market, but it is well worth it fit my needs and for its price, it is very capable. Found the best price, and all inclusive here. 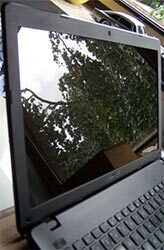 Equipped with the latest and fastest Intel i7 processor – i7-5500U broadwell, this ASUS F554LA is very powerful, yet it is energy efficient – Intel has 3 levels processors, lower to faster, i3, i5, and i7 (what this laptop has). For basic to moderate games, and rendering needs, this laptop is quite capable with its processor and Intel HD Graphics 5500 cards. ASUS F554LA is not a gaming laptop like ASUS ROG model, so you won’t likely be able to run the newest heavy resource games with highest frame rates or settings, but most of my games, from the simplest games, like LOL and minecraft, run very well, and moderate games like GTA V, can run quite well. Furthermore, it has icecool feature, which means, while you are playing games, it will keep your palm rest cool. This is helpful too when you use your laptop in a very long period. This ASUS F554LA-WS71 comes with 8GB of RAM, which seems to be soldered on the mother board all 4, so I guess the RAM upgrade would not be the way I’d like. However, the 8GB memory which comes with it, is a decent amount of a new laptop these days, and is more than adequate for any computer tasks. For capacity of the storage, it has large 1TB HDD run on 5400 RPM, which for most users, it is more than enough to save your files. I am a bit geeky, so I prefer my device to have SSD for the speed, so I want to do SSD upgrade. Not sure about the SSD capacity, but I guess I will get the 1TB SSD. Replacing or swapping the hard drive to SSD requires a techie work as well as caution, because you will need to lift the keyboard off very carefully avoiding the sides that can be damaged, so you can connect the keyboard and the device cable without damaging the device itself. And when you do SSD upgrade, you will VOID your warranty, so please be very careful, I even recommend not to do it if you are not techie, because you can likely break your new laptop. Build quality is decent, overall appearance is beautiful. A few users may be a little bit more concerned about the 1366×768 screen resolution, which is not a full 1080 HD. On the other hands, this laptop performs more than adequate. This ASUS F554LA-WS71 laptop comes with 64-bit Windows 8.1 operating system. I would prefer to have a Windows 7 laptop, but obviously, none sell a new Windows 7 laptop today. But I am slowly getting used to Windows 8.1 so it’s usable, and this laptop will be able to update to Windows 10 once it is released. I have a hope that Windows 10 will be more usable than Win 8. This ASUS laptop has the average battery life, about 5 to 6 hours, depends on your configuration, and how you use your laptop. I recommend this ASUS F554LA-WS71 as a good laptop for anyone from this place, a mid range laptop that has everything you need, a strong new 5th generation of Intel Broadwell processor, 8GB of RAM and 1TB storage.